Mark Wallace was captain of Glamorgan for three seasons. 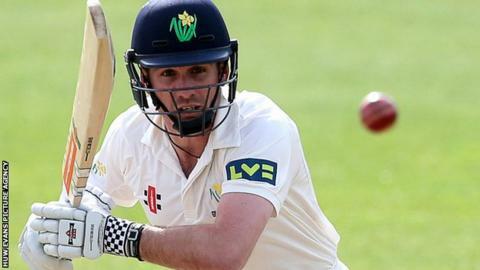 Glamorgan wicketkeeper Mark Wallace has signed a one-year contract extension until the end of next season. The 34-year-old Wallace is in his 18th season, and was captain of the county from 2012 to 2014. "It's fantastic, I've always wanted to play for Glamorgan since my childhood so having the opportunity to do it a bit longer is great," he said. Wallace played 230 consecutive Championship games before missing the final match of last season with injury. Wallace is also chairman of the Professional Cricketers' Association and is looking forward to playing into at least his 19th season with the county. "You're a long time retired, I'm still enjoying the game, and I've still got a lot of things I want to achieve personally and collectively with Glamorgan - so I'm very keen and ambitious." Wallace made his debut in 1999, and was quickly part of the team which won the One-Day League in 2002 and 2004, having taking the second division title in 2001. "I was lucky to come into a really strong Glamorgan side and to win some trophies early on in my career," he added. "Looking back, I probably took it for granted a bit. We've had a few ups and downs since then, but I think we're getting towards the sort of side that could be in a position to achieve those things again. "There are certainly guys I'm playing with at the moment that deserve some medals in their cabinet, so hopefully in the next few years while I'm still around we can get that done." At the start of the 2016 season Wallace had 10,490 first-class runs to his name, at a batting average of 28, with 709 dismissals in four-day games.